Black and white custom photographic prints can be produced from any size film negative up to large format. As well as 35mm, 120 and 5x4, 10x8 negatives, panoramic, or historical glass plates can be printed directly from postcard size up to 1 metre murals. All resin and fibre prints are hand enlarged with burning and dodging where needed and tray processed. It allows the nuances of each image to come through, being able to individually adjust during the enlarging/processing sequence. I’m happy to work from your instructions and/or provide test strips. Enlargers include Multigrade Omega and Durst 5x4 and DeVere 10x8 mural enlarger. Print washers: 2 Novawash archival vertical washers. 12x16inch and 20x24inch. Resin prints are the standard paper type that most photographic labs offer due to their ease of processing and quality at an economic price. 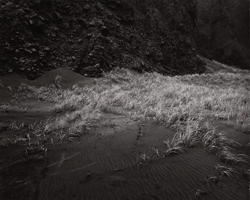 These are produced on medium weight multigrade Ilford pearl paper. Excellent for portraits and general use. For the ultimate in exhibition quality, fibre base prints are recommended. These are produced on double weight multigrade glossy Ilford paper. Rather than a high gloss surface, air dried gloss has a lustre shine achieving an excellent tonal range. A range of alternative paper types and surfaces are also available or can be sourced. All prints are archivally processed with a double fix, wash, hypo clear before a final minimum 1 hour wash before being air-dried on drying racks. Print finishing includes heat flattening through a Kodak Drum to maximise flatness. Toning is also available and dilute selenium toning is strongly recommended for additional protection for prints framed under glass. It cools the image slightly, intensifying the blacks. Usually a 2 day workshop concentrating on making your own camera through to contact printing your images. Can be adjusted for a single day or explore more advanced aspects of pinhole. 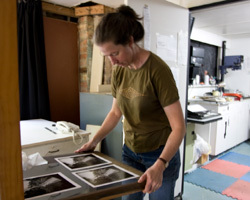 Darkroom printing explores various aspects of fine printing and again can be adapted to suit. Maximum number is 6 people for pinhole and 2 for darkroom.